In short, it's not there yet. While quite a bit of work under the hood and planning has been done already, the main work - porting of the module itself - is still to be done. As Drupal 8 ships with quite a bunch of important improvements, this requires the rewrite of significant parts of the module. In Drupal 7, the Rules module had to solve a lot of hard problems like handling its configuration, configuration translation, dependency tracking, integrity checks and plugins, which all have solutions in Drupal 8 core now. That's awesome, but it requires us to adapt the previous Drupal 7 solutions to work inline with Drupal 8 best practices. However, more than that - the foundational metadata Rules needs is already there as well! In Drupal 7 the creation of the Entity API module, in particular its Entity Metadata wrappers and the backing Entity Property Information, was driven by the needs of the Rules module. While the Rules module makes it simple to work with data for site builders, the Entity module makes it simple for developers first. Subsequently, the Rules module can build upon the easy API and make it accessible via the rule model and its UI. For Drupal 8, the Entity Field API and its underlying Typed Data API are that easy API upon which the Rules module can build upon. That's great, as it means we have the foundation we can build upon in place - but again, it changed (improved) substantially and will require us to adapt a lot of what's there. However, having the Typed Data API and all the necessary metadata built-in means that the out of the box module and entity type support of Rules for Drupal 8 will be substantially better as well. We've quite some work to do to get Rules ported to Drupal 8. klausi and me estimated the task to be additional 1050 hours work (from here). With us, working on it in our spare time besides our other contributions (Entity Field API, Rest module in core, ..) we figured the module won't be ready before sometime in 2015, not unlikely even 2016. That's obviously too late, so we'd love to invest more of our time and work on it during work hours as well, such that we can deliver a ported version in 2014. Our companys cannot afford taking that investment alone, but are up for supporting us and enable us to work on a community rate of € 45/h net cost for the project. You can find more details on the project plan and estimations on our initative site. If you think the Rules module is a valuable tool and helps you building sites faster, please consider supporting our iniatitive! There is a limited goodie for the 50 first supporters pledging >65$ - check it out. If you are going to Drupalcon Austin and you'd love to help, consider signing up for the #d8rules sprint! We'll get started porting either events, conditions or actions to the new API. Lastly, please help to spread the word! 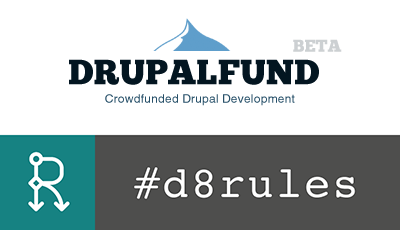 We've got supporter badges that you can embed on your site, and obviously our hash tag is #d8rules!